← Sailors Cove Halloween #5 !! I’ve already written several posts about “Dutch” Kain Xenobuilder’s VO-70, a boat modeled after the Volvo Open 70 Rule used in the round-the-world 2012 Volvo Ocean Race. Dutch’s Mesh Shop VO-70 is a remarkably accurate, mesh re-creation of the Volvo racer, and it even comes with textures that match each of the teams that competed in 2012. 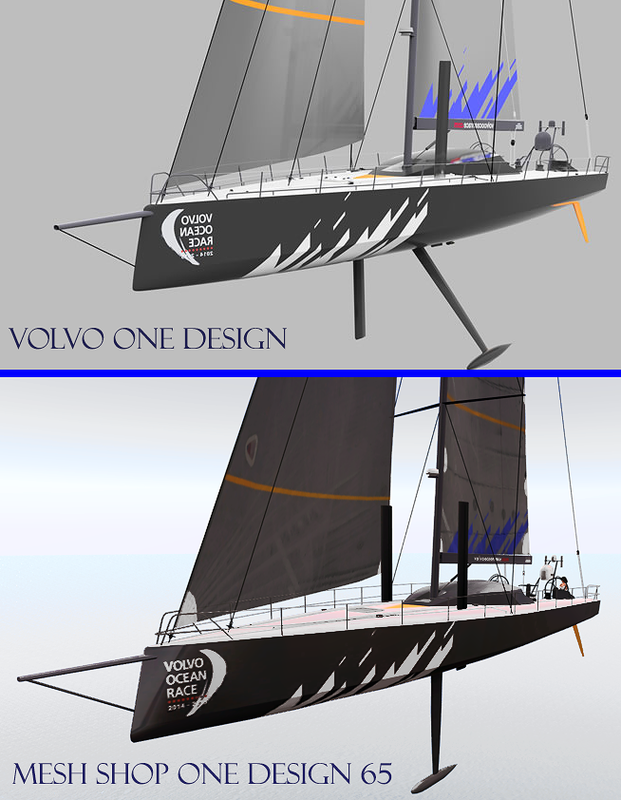 Well, this month Dutch added a new boat to his Volvo fleet; it’s the One Design 65, and it matches the Design Spec for the next VOR that’s scheduled to kick-off in 2014. The 2012 Volvo Ocean Race was a remarkable display of audacity and endurance, as teams raced the world’s fastest sailboats in a damn-the-torpedoes dash around the globe. However, it proved to be a daunting challenge to build a series of individual boats that fit within the box of the Open 70 Rule. That greatly drove up the total cost for each entrant while adding uncertainty and delay. Only six teams survived this pre-game test in 2011-2012. Use of a box design rule also reduced the reliability and safety of the competition fleet. Three of the starting boats (i.e., half the fleet) had to withdraw from the first leg of competition due to structural failures. 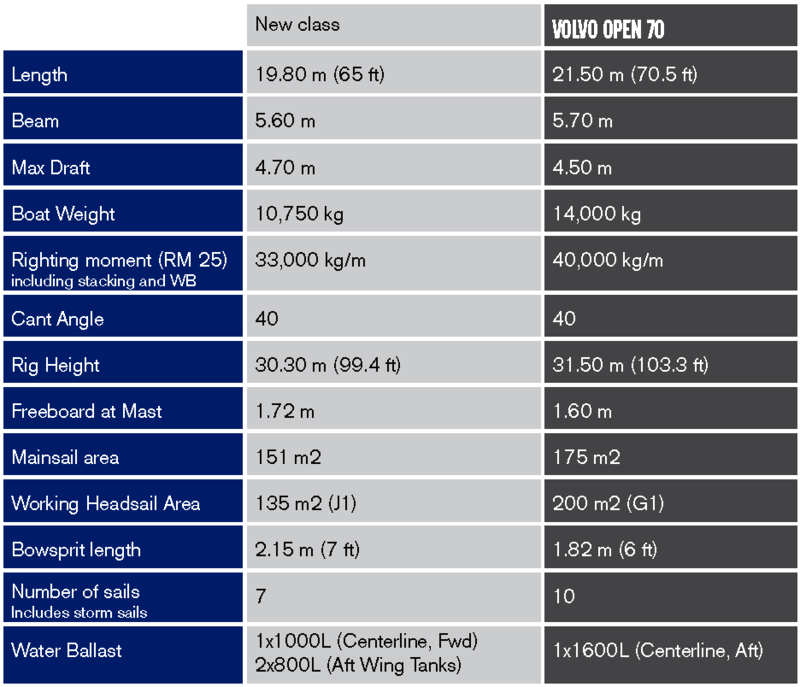 For these reasons, four months ago the Volvo committee announced the next VOR would race in new one design boats. The choice of a one design standard will dramatically reduce costs and development time, while also enhancing safety. 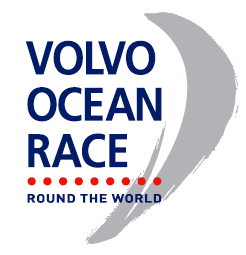 The choice of a VOR one design standard was met with general approval by the ocean race teams, and the increased opportunity the new boat provides will mean as many as a dozen teams could belly-up to the start line when the next Volvo Ocean takes off in 2014. It already looks like an all-female team will be part of that fleet! Well, the sad news is that you won’t see a Volvo One Design officially hit the water for at least a year, as teams plan and the consortium of builders process their orders. The new Mesh Shop OD-65 incorporates many of the features of the VO-70, and then adds a host of new bells and whistles. For example, the boat has redesigned sails that are more realiastic and are far easier to texturize. More important, the OD-65’s asymmetrical spinnaker now convincingly collapses when it’s out of tune, and the mainsail nicely folds on the boom when lowered! The cockpit and deck plan of OD-65 is racer-clean, and less cluttered than the larger VO-70; the boat has just the essential winches and there’s only one central crank station. Nonetheless, the detailing of the build is pretty remarkable. If you click on the image to the right, you’ll see what I mean. 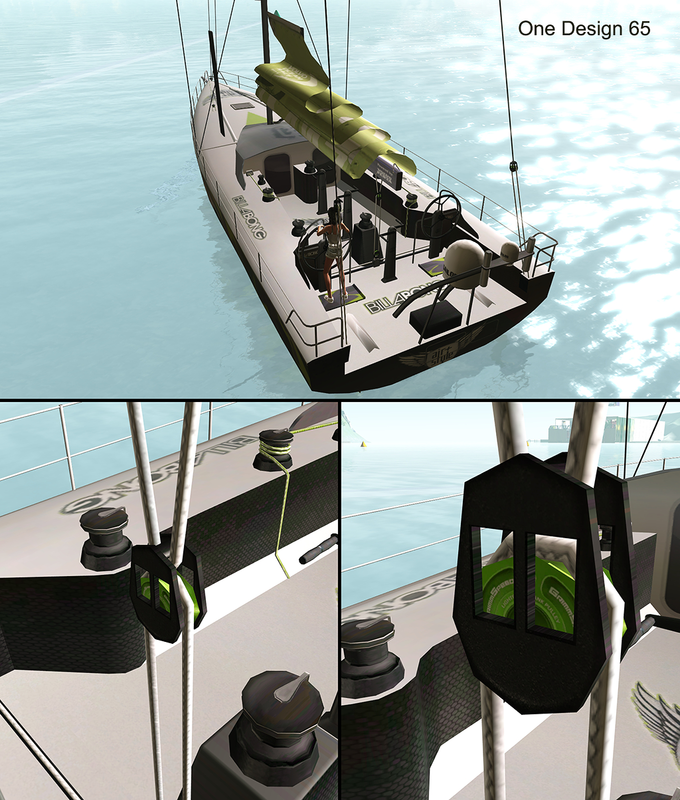 The deck hardware, helm stations and rigging are all finely finished and functionally realistic. You can even read the name of the tackle supplier on the main sheet block shown in the insert! The spars, rigging, and keel are all phantom while sailing, similar to the VO-70, so there’s little fear of hitting overhanging bridges or running aground in shallow waters; the boat only draws 1.5m. You won’t run out of prim, either. The OD-65 weighs in with a resource-scrimping LOD=96; that’s less than half the size of the VO-70 (LOD=212)! VO-70 has the advantage in the texture department. 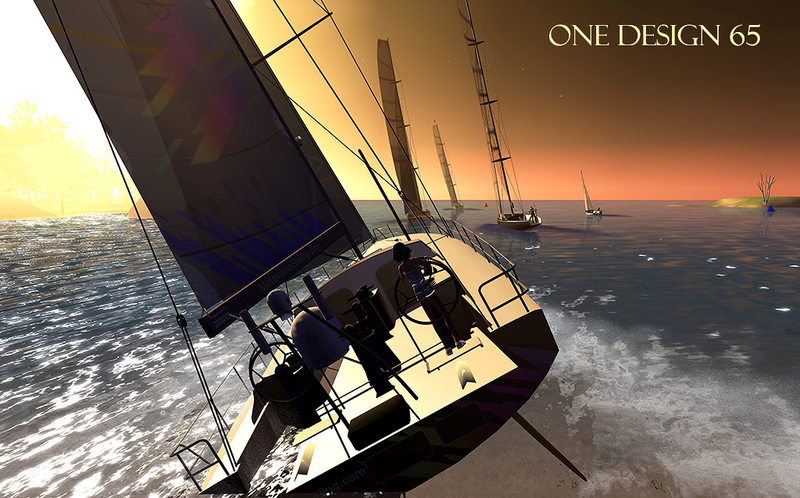 It comes bundled with more than a half-dozen themed texture sets that are based on the 2012 Volvo Ocean Race team graphics. The designs are very nicely done, and easy to apply. In contrast, the OD-65 only comes in one style; it’s an understated charcoal hue, and it reinforces the impression that OD-65 is a lean, mean, serious racer. Speaking of pimping your ride, let’s talk OD-65 performance. No surprise the boat shares much in common with the VO-70, so most of my comments about that boat also apply. In fact, you can get a start-up version of the OD-65 manual here that should answer most of your questions. Under the hood, OD-65 uses the BWind 2.5 sail engine developed by Becca Moulliez. Over the past two years BWind’s established itself as an extremely popular, low-lag, easy-to-use, and highly flexible design platform. 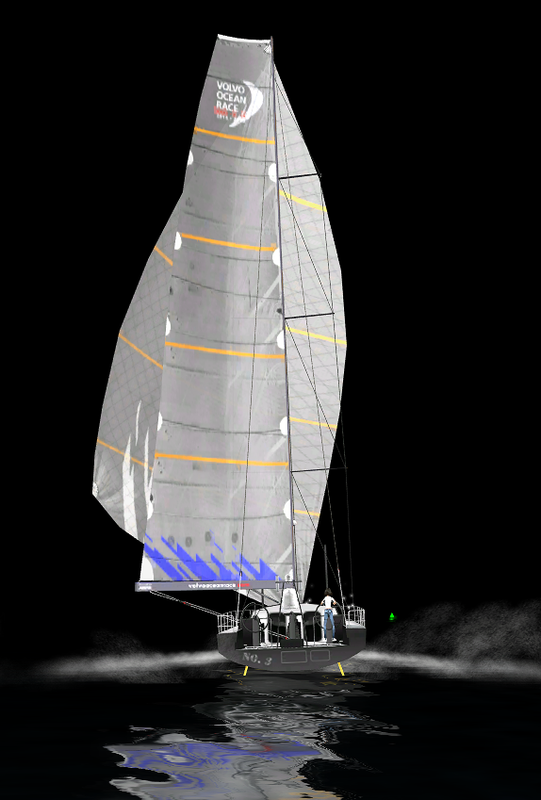 If you’ve ever sailed a BWind boat, you’ll have no trouble getting under sail with the OD-65. 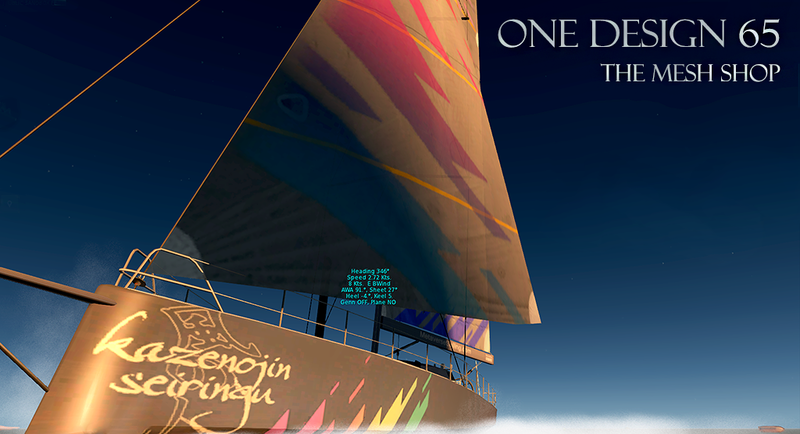 The boat uses a limited set of intuitive chat commands and keyboard arrows to adjust the helm and control the sails. There’s also a color-coded numerical display that gives feedback about essential race parameters. 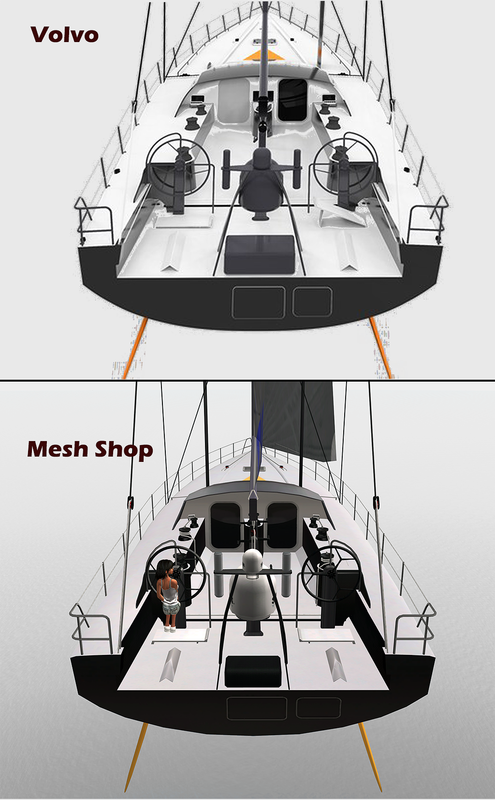 As I discussed a few weeks ago, Mesh Shop boats have their own wind setter system that is truly innovative and quite distinct from the setters SL skippers routinely use. For everyday sailing, OD-65 is like any other BWind boat. A skipper just has to say “cruising” in chat, followed by the standard BWind speed and direction commands. However, if a competition is planned, a skipper just says “racing.” That makes the boat listen for a set of wind parameters broadcast to the fleet by the Mesh Shop’s unique iPad wind interface. I’ve talked about the VO-70 iPad controller before, but the interface is even better with the introduction of the OD-65. A skipper or race director can use the touch-tablet to key-in wind direction and intensity for all nearby racers; it can do a lot more too. It can set the amplitude for short-term gusts and shifts, as well as intermediate and long-term changes in wind direction. 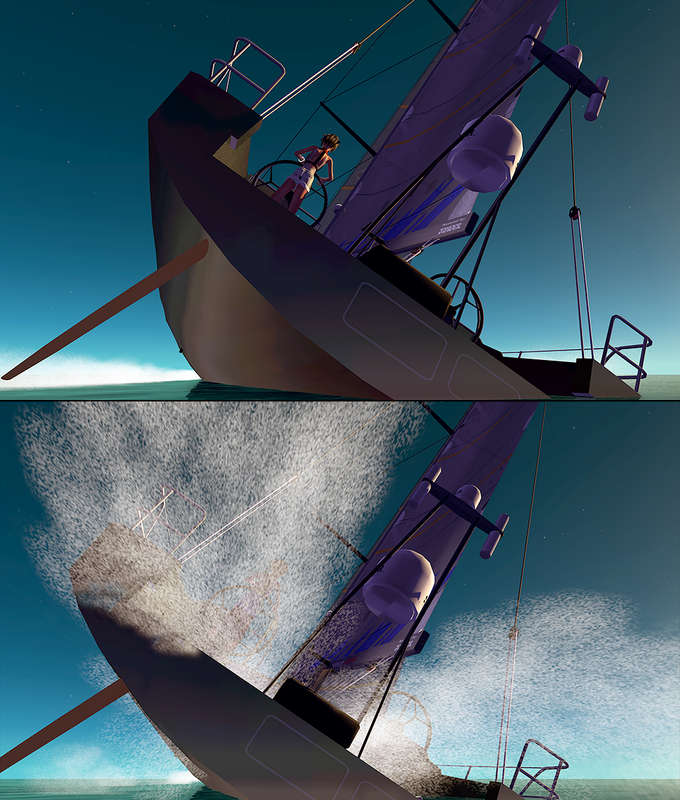 I’ve already described how the ultra-short term “wind jitter” works for Mesh Shop boats. The new controller adds options for longer term ‘wind drift’ as well, and the modulation curve for that feature is shown in the chart to the right. 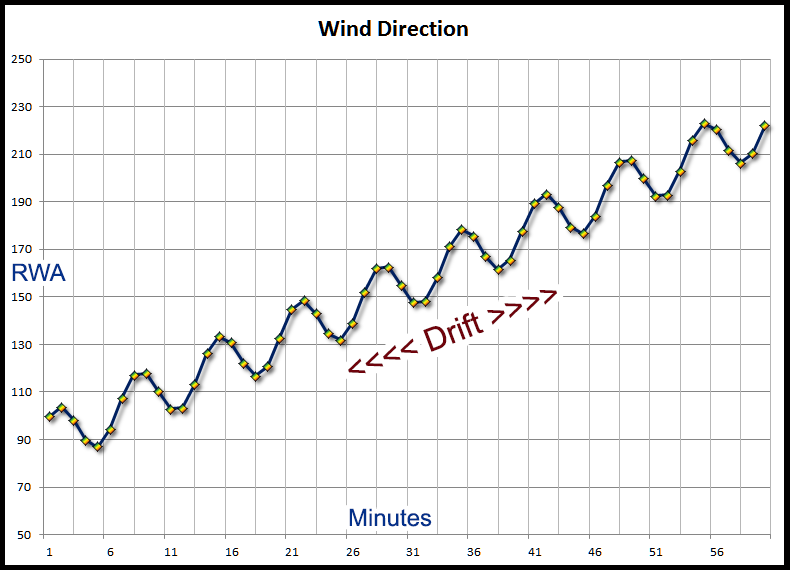 Here’s how the drift works: Once a race starts, the average wind direction gradually changes over time in a linear progression. There’s also a several-minute sinusoidal ‘wobble’ superimposed on the directional shift that’s intended to keep racers on their toes. 🙂 The iPad setters are now free for any sailor or RD who wants to give them a try. If any of this wind stuff sounds boring or confusing, don’t fret too much! Dutch just posted a very nice explanation of both the new wind and the iPad wind setter functions in a pdf format manual! Go get a copy here! The performance curve for Dutch’s original VO-70 went through a number of updates as new features were added. Each performance change brought the boat closer to the real Volvo Racer. Well, that process continued through the OD-65’s beta development as well, with some pretty remarkable results. The chart to the right has a blue curve that plots boat speed as a function of real wind angle for the launched OD-65. The chart has a nearly identical red curve superimposed on the blue one. 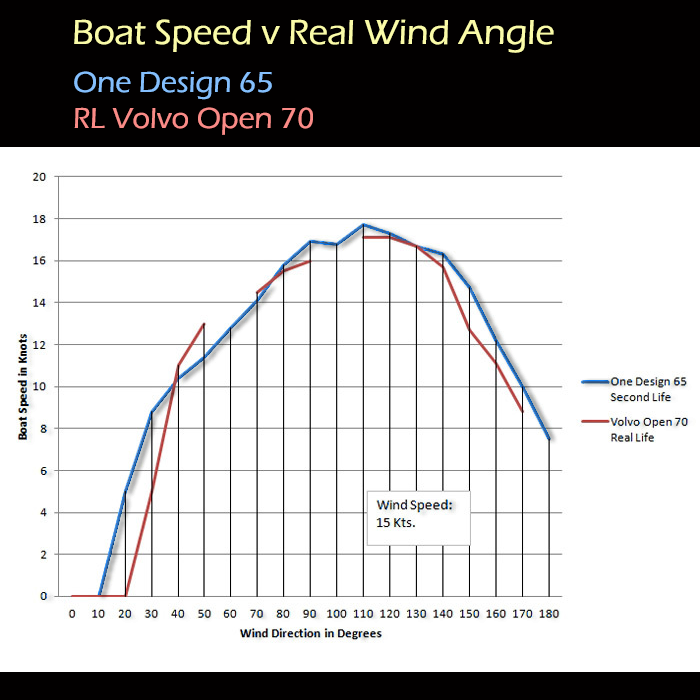 That red line reflects the performance of the RL Volvo Open 70 race boat. Woots! The boats are nearly identical. The data comparison set comes from Dutch’s testing, but my numbers look the same. But WOW, today I’m looking at the details of this boat and that speed plot above, and I’m thinking that Dutch Xenobuilder just launched a virtual boat that embodies the physical dimensions, detailing, and polar performance of the next real life VOR contender. OD-65 isn’t an online cartoon boat; it’s a first-stage, realistic emulation of the actual Volvo Racer. That idea is worth thinking about. Let me add that Dutch isn’t alone. This past summer a small handful of builders launched new vessels that also reveal a striking attention to detail and handling. With the commitment and dedication of such great builders, maybe SLSailing is turning a corner this year, and setting a new, higher bar for realism in virtual sailing. This entry was posted in announcement, OD-65, Sailboats. Bookmark the permalink. Thanx! As always a thorough walk through with a positive attitude. I especially like the passage where you write “OD-65 isn’t an online cartoon boat; it’s a first-stage, realistic emulation of the actual Volvo Racer.” Perhaps that’s overdoing it a bit, when you’ve just written about the sideslips, missing shadow and phantom keel, but fair enough: It comes close.